A neatly dressed table is a basic necessity for any kind of event, may it be an official meeting, wedding and reception party, prom celebrations or any kind of social gathering. 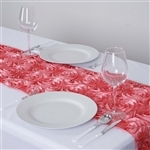 A smartly selected table runner can easily alter even the most humbly dressed table into a designer countertop. 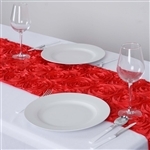 Transform your next occasion or meeting into a more vibrant and lively experience with the new Grandiose Rosette Runners. The bold rose print of the linen, adds the spirit of victory, desire and pride to the entire event. You also have the freedom to select from a wide range of colors. Contact us for bulk pricing orders. We ensure that the goods are delivered via world class delivery services, ensuring safety of shipment.